[Update March 9, 2017] PyeongChang 2018 has removed the user comment area. This is after deleting dozens of our messages protesting the Korea’s horrible cruelty. Thank you everyone who participated and spoke out for the poor Korean dogs and cats. The PyeongChang Organizing Committee for the 2018 Olympic Winter Games (POCOG) was launched back in October 2011. It is an event which has been a long time in the planning: the POCOG want to make sure they ‘get it right’. We want to let them know that the best way to ‘get it right’ is, in the first instance, to put a stop to the ‘wrong’ that is being committed in the dog and cat meat trades. We want to let them know that, if they do nothing to stop these ‘wrongs’ by permanently ending these horrendous trades, many people across the world will boycott this Olympic Event, and will boycott the sponsoring companies, too. Click HERE to post your message on their page. You can do this by scrolling down to the bottom of their page, for the “Reply” section where you can post your message, after logging in via Facebook, Twitter or Google. Click HERE to post your message on their Korean page. 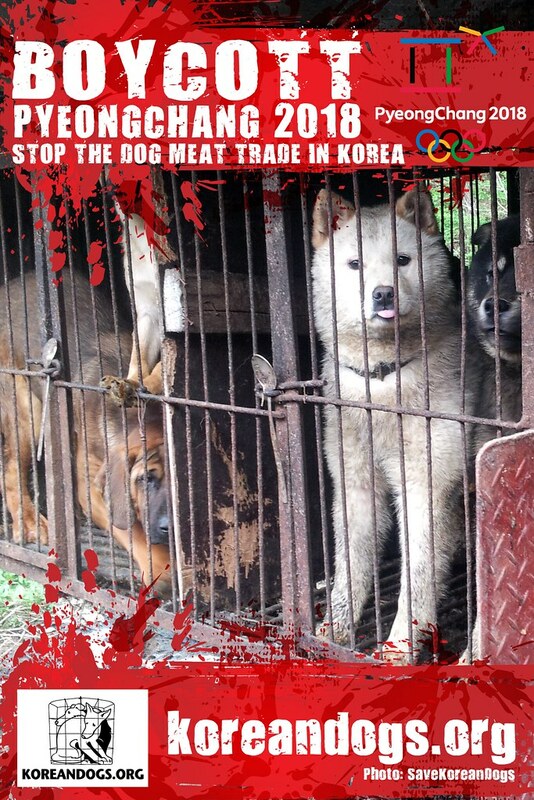 Mr. Hee-beom Lee, President and CEO, and all members of the Organizing Committee, we want to let you know that the best way to ensure the success of your PyeongChang 2018 Olympic events would be to permanently end the dog and cat meat trades – now – before these events take place, otherwise we will boycott PyeongChang 2018 and all of the sponsoring companies. And, we call on you, Mr Lee, who was awarded the Order of Service Merit, to once again stand up and render outstanding service to your country by taking a lead in permanently banning the dog and cat meat trades – for the benefit of these Olympic events and all the citizens in your country. Photo: Dog slaughterhouse in Yangsan, South Korea. Nami Kim Team. Stop eating dogs and cats. Stop the barbaric cruelty immediately! The world is watching! Have respect for all life – if you cannot respect those who have no voice how can you respect anything. This is not ok! Can we please end it already?!! Members of the Organizing Committee. ..If you want the 2018 Olympics to be successful. YOU MUST END THE DOG MEAT TRADE. .the world is watching and WE ARE NOT GOING AWAY. The history of cats and dogs, as far as I know, throughout the world has not been for eating, the relationship that has evolved makes your using them as food, animals with such hearts, barbaric. Please stop it!! Please stop this this this is so cruel we are not suppose to eat cats and dogs. I am getting sick only to look at the pictures of the poor dogs in small cases and when I read about what is going on in your country I am getting even more sick. In Denmark we treat the dog and the cat as family members and all people here think you must be monsters, when you do this to these poor animals. No animals should be treated like this, it is so disgusting, how can you? I’m so ashamed to know this exists in your country. If you treat your animals, this way, I’m afraid to know how you treat your woman and children. Please make this stop. No living creature deserves to be beaten boiled alive and tortured no matter what the reason. This is sickening. VEGANISM is the Only Logical and Moral response ! ! ! Dogs/cats are not food, they are pets, family! BASTA CON LA CRUELDAD QUE HAY EN EL PAIS DE COREA!!!BASTA!! !ESTAMOS EN EL SIGLO XXI,PARA QUE SIGAN COMPORTANDOSE COMO CANIBALES!! !LOS ANIMALITOS DEBEN Y TIENEN QUE VIVIR LIBREMENTE,NO BAJO LA CUCHILLA DE LOS HUMANOS!!! !BASTA YA,NUNCA CREI QUE EN COREA Y OTROS PAISES ASIATICOS HUBIERA TANTA IGNORANCIA,EL GOBIERNO TIENE QUE EDUCAR A SU GENTE,QUE EL CALOR NO SE IRA MATANDO CRUELMENTE A LOS POBRES E INDEFENSOS PERRITOS Y GATITOS,ESO NO ES VERDAD!!!!!!!!!!! !ES MUCHA IGNORANCIA LA QUE TIENEN,POR DESGRACIA,LOS ANIMALES NO TIENEN QUE PAGAR LOS PLATOS ROTOS DE LA IGNORANCIA DE CIERTAS PERSONAS,BASTA YA DE SACRIFICAR A LOS HERMOSOS E INDEFENSOS ANIMALES!! !BASTA YA!!!!!!!!!! !STOPPPPPPPPPP NOWWWWWWW!!!! There is no reason or excuse for torturing animals ANYWHERE in the world. Pls stop cruelty to all animals they r beings of this earth just like you and me. Stop eating them!!! Why are you all posting your comments and protests HERE? NO ONE sees them but other protesters! You’re supposed to comment on the links given above! Telling them to “Stop” on this page makes no sense and helps not one dog or cat! Done, on their page. Please guys as someone else also said, post on their offical page as was advised in the instructions. Also, while venting out is fine but calling them names won’t make them change one bit. Money drives the world and it’s the commercial aspect and bad publicity which will scare these people. They have been holding games after games and international events and I really wonder if our comments affect them even one bit. As long as they have the backing of the IOC and the sponsors, what deters them from holding the games. I can understand about Samsung & LG but Coca Cola, Panasonic and others are not Korean companies. Why can’t they be forced to stop sponsoring events in Korea? pure and utter Brutality at the highest level no animal should have to suffer these atrocities these are loving Pets they have feelings it’d disgusting crue act stop this abhorrent cruelty wicked and very evil. Bastaaaaaa con queste crudeltà verso questi animali, siete dei barbari incivili e mi auguro che presto una grande catastrofe vi spazzi via dalla faccia della terra…merde sanguinarii!!! SICK DEMENTED AND BEYOND BARBARIC AND CRUEL !!! STOP THE KILLI G OF THESE BEAUTIFUL ANIMALS AND SOME DAMN COMPASSION!! WTF IS WRONG WITH YOU HEARTLESS LUNATICS!!! Stop this cruel and evil on our animals you who fave to answer to your God to go to heaven to go through those gates you have to do good but for ghis actions on his creatures of whom he send to love and protect only he’ll for this evil deeds yee for on his animals who gives us so much trust and love how can yee stand by and allow this please in love of god stop. Stop this cruel and evil on our animals you who have to answer to your God to go to heaven to go through those gates you have to do good but for ghis actions on his creatures of whom he send to love and protect only he’ll for this evil deeds yee for on his animals who gives us so much trust and love how can yee stand by and allow this please in love of god stop. Stop this cruel and evil on our animals you who fave to answer to your God to go to heaven to go through those gates you have to do good but for this actions on his creatures of whom he send to love and protect only hell for this evil deeds yee for on his animals who gives us so much trust and love how can yee stand by and allow this please in love of god stop. Please use your power wisely and stop this horrible cruelty. We would love to visit your beautiful country, but we cant’ stand these horror and won’t support it as tourists. Mr. Hee-beom Lee, President and CEO, and all members of the Organizing Committee — We want to let you know that the best way to ensure the success of your PyeongChang 2018 Olympic events would be to permanently END the dog and cat meat trades – NOW ! – before these events take place, otherwise we will BOYCOTT PyeongChang 2018 and all of the sponsoring companies.